Former Mayor Lorraine Morton administers the oath of office to Mayor Steve Hagerty. 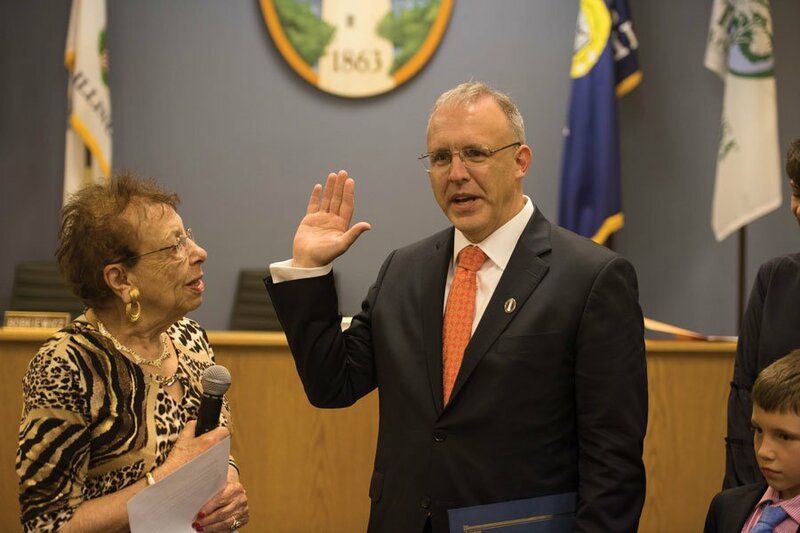 Hagerty and other members of the 80th City Council were sworn into office Monday evening. The 80th City Council took office Monday evening in the Lorraine H. Morton Civic Center, following the inauguration of a new mayor, three new aldermen and a new city clerk. New members of council include Mayor Steve Hagerty, City Clerk Devon Reid, Ald. Robin Rue Simmons (5th), Ald. Tom Suffredin (6th) and Ald. Cicely Fleming (9th). They join incumbent council members Ald. Judy Fiske (1st), Ald. Peter Braithwaite (2nd), Ald. Melissa Wynne (3rd), Ald. Donald Wilson (4th), Ald. Eleanor Revelle (7th) and Ald. Ann Rainey (8th). Hagerty made his first mayoral remarks to the council and a crowd of family and friends, praising the high voter turnout and calling for respect and civility. At a time of polarizing politics, Hagerty challenged the new council to set a positive tone for other communities. Prior to his inauguration, Hagerty stepped down from his role on the boards of Youth & Opportunity United — an organization that provides after-school care — and First Bank & Trust, a local bank. Hagerty announced the decision Monday in a statement on Facebook. Prior to the new council’s inauguration, previous officials met for a final time and awarded commendations to those leaving office. Former Alds. Delores Holmes (5th) and Brian Miller (9th), as well as former city clerk Rodney Greene, were commended for their years of service on the council. Former Ald. Mark Tendam (6th), who did not attend Monday’s meeting, was also commended for his service. Rainey and Wynne presented Tisdahl with a certificate and a gold-plated gavel. “You’re the kindest, most thoughtful, most hard working — honest, decent, sharing, generous, inclusive, least judgmental — human being I’ve ever met,” Rainey said, holding back tears. City manager Wally Bobkiewicz presented Tisdahl with a parting gift on behalf of city staff. Typically, Bobkiewicz said, outgoing mayors receive clocks or plaques, but he thought of a different gift for Tisdahl that would incorporate her dedication to water in the city. Tisdahl said the sculpture was one of the most “unique and cool” gifts she has ever received. She also thanked the members of the 79th City Council for their years of service. Correction: A previous version of this story misspelled Cicely Fleming’s name. The Daily regrets the error.